Protect and preserve your leather boots. 4 How Do You Remove Mold Stains & Smell From Shoes? Leather boots are stylish and comfortable, but they can take a real beating in the winter. Softer leathers can break down in the wet conditions and get damaged from road salt. To care for your leather boots in winter, and preserve and protect them for years of use, use proper cleaning techniques. 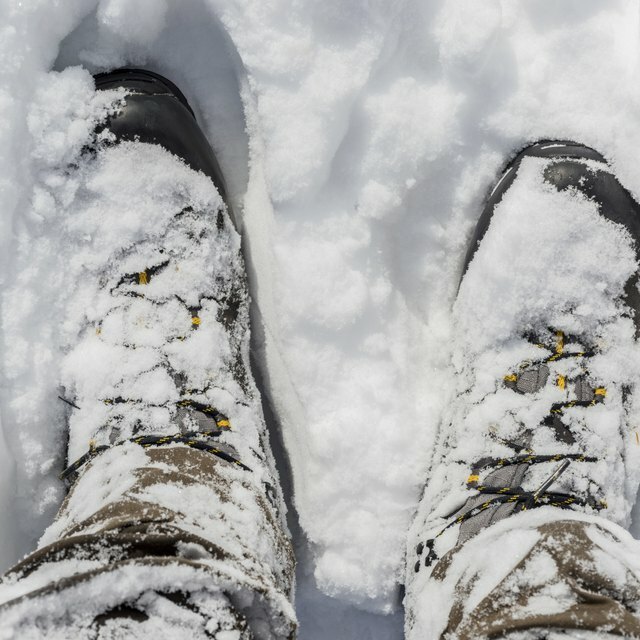 Take shoes outside and brush off any loose dirt or salt. Cover the table or floor area with a clean, old sheet or plastic tablecloth. It's important to protect other items and surfaces from the cleaning and spray solutions, as well as the dirt on the bottom of the boots. Place your hand inside the boot to keep it in shape as you apply shoe products. Wash wood or synthetic heels and trim with mild soap and water, using a soft cloth. Dry thoroughly. Use a soft, clean white cloth to apply leather-cleaning solution to any soiled areas of the boot. Rub gently to remove spots or stains. Apply cleaning solution to the rest of the boot evenly. Leave boots on work cloth or tile floor. Let dry. Return boots to workspace. Using a fresh white cloth, buff shoes until leather has a soft rich glow. Stuff boots with tissue paper to keep shape. Spray boots with protective solution, holding the can 6 to 8 inches from the surface and applying evenly. Allow to dry at least one hour at room temperature. Remove dirt or salt as it happens. If necessary, use a slightly damp cloth. For tough salt stains, apply a half water, half vinegar solution with a soft white cloth. When dry, re-clean with leather solution. Keep boots out of direct sunlight and store in a temperature-controlled environment. Extreme conditions can cause leather to dry out, fade and crack. Re-clean and spray your boots at least twice more during the season to maintain and protect your boots through harsh conditions. Clean thick or faux fur linings with a gentle upholstery cleaner. Follow the manufacturer's instructions for fabric recommendations and application. Use fabric refresher spray or shoe inserts to remove odors from the insides of shoes. Apply matching shoe polish to fill in any scratches for very worn and scuffed boots. Follow manufacturer's instructions for application. 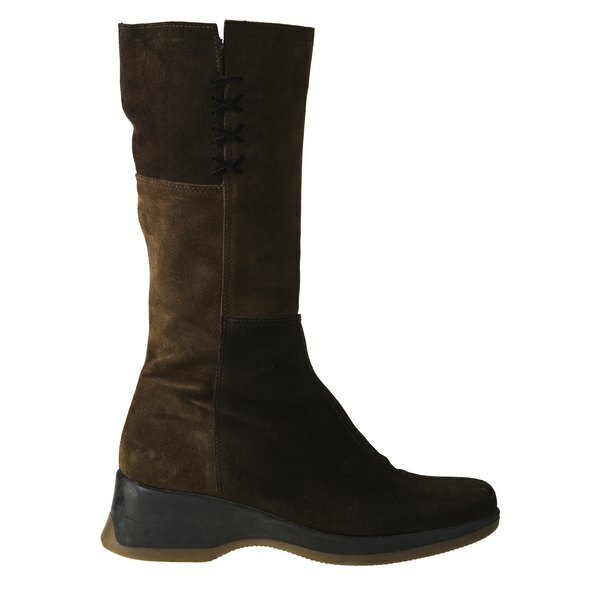 Use a nylon bristle brush for suede boots to remove salt or other stains. The vinegar/water solution will also work on suede for removing tough salt streaks. Shoe stores often sell special stain remover blocks for suede boots and shoes. Clean boots thoroughly before storing during the summer months. Boots left dirty and salt-encrusted may be permanently damaged by next season. The leather protector seals the boots against water and dirt. If worn in heavy rain or snow, quickly wipe down with a soft cloth before placing in the closet or shoe holder. If worn infrequently, keep boots boxed up in between wearings to protect from light and dust. Stuff tops of boots with tissue to maintain their proper shape. For best results, buy leather cleaner from a shoe store or shop that specializes in leather. When buying new boots, purchase cleaner and spray at the same time. The salespeople can give you recommendations on the best products for your boots. Follow manufacturer's instructions for using cleaner and spray. Use in well-ventilated areas and keep away from flame and heat. Spot test cleaners on an inside, non-visible edge when possible, particularly on brightly colored leathers.